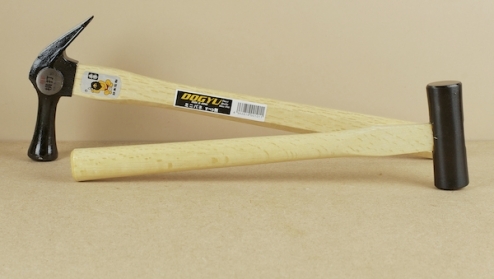 A choice of two hammers from Japan. 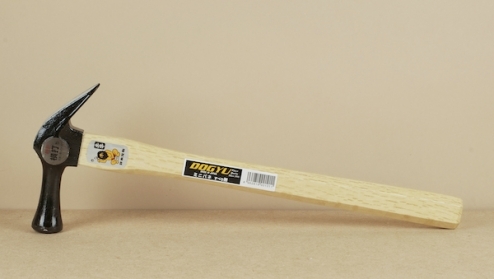 Hammer no.1 - a carpenters hammer for the driving and pulling of nails, with a 400g (about 14oz) tempered tool steel head and 390mm shaped Japanese white oak handle. The main striking face is machined with a slight dome as are 2 'eyes' either side of the head which allow the hammer to be properly used side-on in tight situations. The claw is also sharpened more than is common in western hammers, and tapers to a finer V, allowing more effective removal of smaller pins. 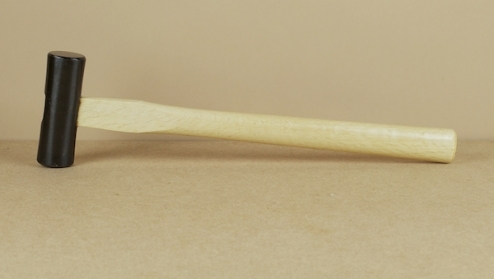 Hammer no.2 - a well balanced drop forged hammer, with an oval bronzed flanked slightly flared 375g (about 13 1/4oz) head and 330mm shaped oak handle. A more subtle tool than its deceptively pure form might suggest, the two faces are dissimilar, one being ground flat for the clean striking of chisels the other slightly convex allowing nails to be driven flush without damaging the surrounding timber.